Are you looking out for indoor activities for kids during monsoon? Looking for ways and means to keep your toddler/kids busy indoors? Here are the 10 fun activities to do indoors during the rains to keep your little one engaged. Your little one, like mine, may be getting bored sitting inside the house most of the time. Monsoon is here and it is raining cats and dogs. Due to the heavy rains, you remain indoors most of the time. So is your toddler/kid. You don’t want them to be out in the rains where there is a high risk of them catching an infection or fever. Presenting to you the 10 fun indoor activities for kids they will love during this rain. With the rains pouring outside, don’t you think it’s difficult to divert your toddler from not playing in the water? Set up an alternate water play at home. This works with toddlers. Collect some rain water in a tub or a bucket. Make paper boats out of newspapers and float them in the water. Or make holes in a bucket/mug and pour water through it. A mini rain shower is ready for your kids to play with. Never leave kids under 4 years unattended near water. This fun game should be played strictly under adult supervision only. Rains are the best time to get the card and the board games outside. For the younger lot, the alphabet, fruit, animal cards works the best. You don’t have to go by the rules. You can just ask them to arrange and rearrange the cards into different designs and layouts. Pretend that it’s a raining inside your house as well. The raincoats and the umbrellas can be used inside and you can very well set up a rainy day inside the house! It will be fun for the kids to pretend play a rainy day. Heavy rains outside can keep you under house arrest for long. You can plan a movie time with your kids. Arrange some popcorns or snacks and enjoy the time with your little one. You can also refer to the guide on how to survive a movie with your kid minus the drama. Kids love helping you with the kitchen and household. What better way to keep them busy indoors. Let them play the role of your assistant in everything you do, be it cleaning, cooking, dusting etc. Reward them with a favorite treat or a movie for the help they have done. Involve your kids in some art and craft. For example get ready for festivals like Diwali or Christmas. Make them do a card for birthday or just paint something that they want to. For the younger children, ensure that this is done under supervision. Indulge in some storytelling and some story book reading for the older kids or for the younger lot , board books and picture books. Lying on the bed with a book is something that all of us like to do on a rainy day, so why not enjoy the company of your toddler while doing so? Have an in-house party with your kid and some friends. Do we need to find a reason to party? Indoor party is a great way to have fun indoors. You can celebrate the birthday of her favourite doll or a wedding indoors. Some music and dance with healthy yummy snacks can add to the fun. Choose your neighbour’s kids as guests so that you don’t need to pick or drop the kids. Try your hand at baking a small cake or cupcakes or cookies. Kids absolutely love getting involved in these activities. You could make them decorate the cookies or icing cake the way they want and present it to the family during dinner. Set up your living room as a classroom and you pretend to be a student and your child a teacher. It is fun listening to your child teach you poems and alphabets. 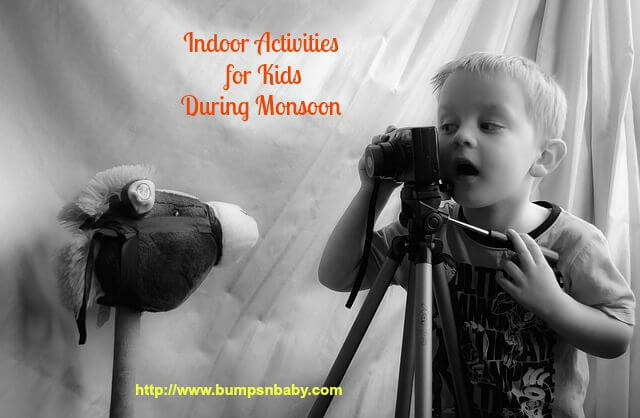 Hope you enjoyed this article on indoor activities for kids during monsoon. Is it raining heavily at your place? How do you keep your toddler engaged? Which all games and plays do you take part in? What’s your kid’s favourite indoor activity during monsoon? Do share with me in comments. A software engineer by profession, Saumya is mother to 16 months old Tishya. Juggling between work and motherhood, she is an occasional blogger too. A malayali by birth, Mumbaikar by heart and a Punekar now for the last 4 years!!! She loves her ‘me time’ with her daughter and believes in celebrating every moment of life. Celebrate life is her mantra. Currently she is celebrating motherhood. Water play sounds like a lot of fun! Great tips, thanks! Lovely blog! Yes it is hard to take your little one out during the monsoons. Then why not do something interesting indoor! I spend time whenever I can with my little one and mostly during the monsoons our favorite pass time would be watching some animated films or play some soft soothing music.